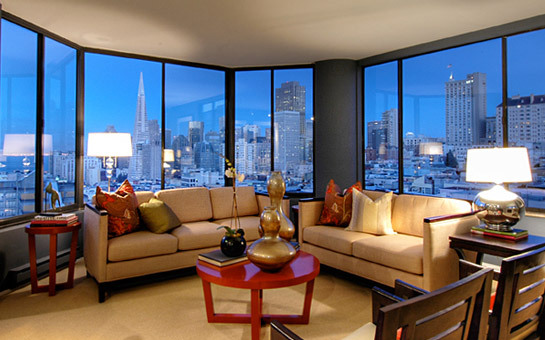 Spectacular view condominium apartment with almost 180 degree views by day and dazzling City lights at night from Coit Tower to the Bay Bridge, Financial District and Nob Hill skyline. Easy access to shopping, dining and entertainment in the best known neighborhoods of Huntington Park Square, Chinatown, North Beach, the Financial District and Union Square. The apartment is in move-in condition with new paint, refinished hardwood floors, new sisal patterned carpeting, window coverings and track lighting. ENTRY GALLERY with inlay hardwood floor & custom track lighting for art. Spacious LIVING/DINING ROOM features a gas fireplace with marble facing, expansive picture window views. 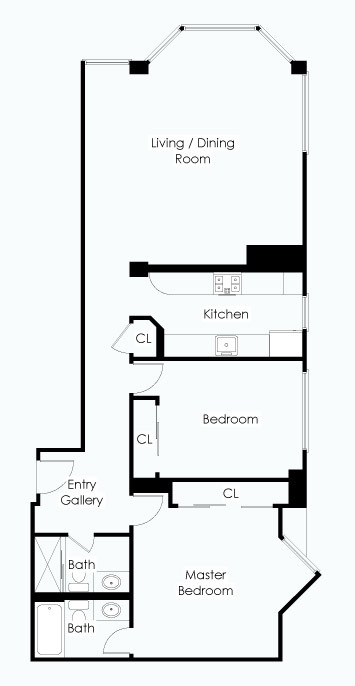 Spacious MASTER BEDROOM with extra wide closet storage. Bay window outlook to the southern/Nob Hill skyline. Adjoining BATH with marble surround, vanity and shower over tub. Second BEDROOM with picture window outlook to the south. Second BATH with marble surround and stall shower.